greenify hibernate hibernation Greenify is here to make sure you keep breathing life into your phone! Greenify is here to make sure you keep breathing life into your phone! Greenify aim's at breathing life into your smartphone by putting your unused application in "hibernation", allowing you to get longer battery life. (ROOT REQUIRED). I was browsing around Google+ like I usually do and looking at new app's to try and play with and this one struck me as it's been updated for Kitkat. Greenify wants to make sure that you can still use your application even thought they've been place in a hibernation state unlike Titanium Backup were the application is disabled entirely. Making it much easier to stop those pesky apps from running and killing of your battery. Now if you're looking for features, well your in for a PUNCH! There's plenty to choose from with varying degree of use but that will set your back 2,99$ for the "donated" version of the application which I gladly gave away. This will also require you to have the Xposed Framework as well and have the Greenify module activated. Boost mode: Android framework is patched to allow Greenify to perform hibernation and other operations without the root routine, which is usually buggy (for some root tools) and slow. Allow (most) system apps to be greenified in Greenify. Android framework is patched to deprive system apps of immunity to hibernation. Beware, most system apps are critical to the basic functionality of your device, once greenified, you may lose some part of usability. If something bad happens, degreenify the system apps you recently greenified and reboot, or deactivate this experimental features of Greenify and reboot. 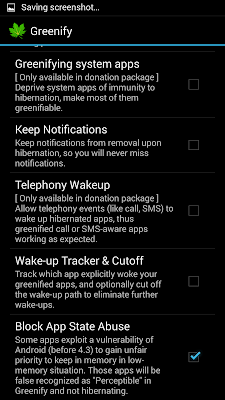 Allow GCM push message to wake hibernated apps. Google service framework is patched to allow the GCM (Google Cloud Message, a.k.a. C2DM) broadcast to wake the hibernated apps, thus you can greenify some apps without losing the ability to receive push message. Attention: Not all apps use GCM as push mechanism, some apps create their own connection for push in background service, thus can't benefit from this patch and their push messages can never survive hibernation. Please DO NOT ask for that, it's just a "mission impossible" in practice. Instead, ask their developer to adopt the more RAM-and-battery-friendly GCM push. Keep Notifications after Hibernation. 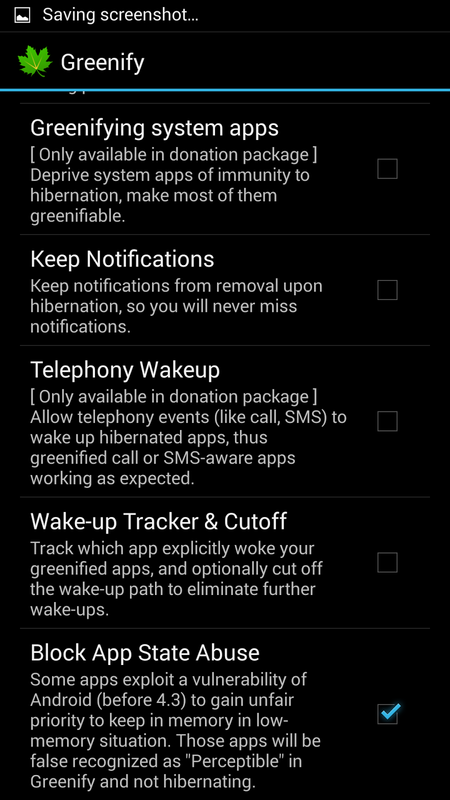 Android framework is patched to keep notifications from being removed when application hibernates. Wake-up Tracker. Android framework is patched to track which app implicitly woke your hibernated apps. You can decide whether to cut-off the wake-up path to avoid further wake-ups. Block App State Abuse. Block the the abuse (via a vulnerability of Android up to 4.2) used by some apps to keep themselves from being killed by Android. This abuse leads to undesired apps "Not Hibernating" due to false "Perceptible" state in Greenify. PS: For Android 4.3+, this can also remove the annoying permanent notification from some apps, which was hidden in pre-4.3 system.